Published August 14, 2018 By Anna T. This post may contain affiliate links. Regardless, I only recommend sites I've researched and/or used and trust. Hotel Tonight is a popular phone app that matches unsold hotel rooms with travelers who need a place to stay. The company forms a close partnership with hotels in different locations, and when those establishments have fewer guests than expected, they can list the extra rooms through the app. This means that travelers are able to book hotel rooms at the very last minute without having to worry so much about reservations, and sometimes these rooms can be a significant value compared to the normal rate – a 50% discount, or even greater, is not all that uncommon. Hotel Tonight employs a significant number of full-time home-based customer service agents in certain areas in the United States. Below we'll discuss the nature of the job, and evaluate the pros and cons. As a remote customer service agent for Hotel Tonight, you'll be answering calls, communicating with customers via email, and through an online chat interface. Some of the typical issues that come up include technical questions regarding the app, billing issues, and booking problems. Their listing says this can be a high pressure job, and some of the feedback I've seen around the web during my research suggests that the call volume can be pretty high. Like all customer service gigs, you may be dealing with angry people at times, so you'll need patience and a cool head. Because a lot of the work apparently involves troubleshooting and walking customers through various operations with the app, a background in tech support might be especially helpful for this gig. They don't describe the exact pay amount in their job listings, and I couldn't find any solid numbers in my research. It appears that members of their remote customer support teams fall into a few different categories, and pay might vary to an extent depending on your exact department. I saw numbers as low as $17K per year, and as high as $50K. There are quite a few extra perks and benefits for workers, including paid vacations, a matching 401K, health insurance plans, and a yearly $500 Hotel Tonight bonus credit so you can use the service when you travel. This is a full time job, and it's clear that people are making a living doing it. The pay may not be amazing, but it doesn't appear to be horrible, at least not for most workers. All the job listings I've found are for full time workers. They appear to offer jobs on all shifts, including nights, weekends, and holidays. Even though these are remote jobs, the positions are only open to people in certain states. Job openings show up for people in particular states at different times, so you'll have to keep an eye out to grab one when they're hiring people in your vicinity. While the company does occasionally have jobs open outside the US, these listings do not appear to be for at-home work. The skill requirements vary a bit depending on the specific job listing, but in most cases they seem to expect at least a year or two of previous call center experience, and a lot of technical knowledge about phone operating systems. Hotel Tonight is looking for people who are quick on their feet, good under pressure, and skilled at multitasking. Also since this is a remote job that occasionally requires talking on the phone, you'll need a quiet place to do your work where you won't be disturbed. Hotel Tonight customer service agents need a decent computer with a very good internet connection. When work at home positions are available at Hotel Tonight, they list them on job sites around the web and on their own website. You submit an application, and if you're selected, they'll do an interview via video conferencing software. The details of their interview and training processes aren't publicly available. I used Glassdoor.com and Indeed to find feedback from people who've actually worked for Hotel Tonight. Most of the reviews were overwhelmingly positive. The company supposedly has a great work culture, and a helpful management team. Only a few of the reviews were from home-based workers, but those were also generally positive. People seem to love the benefits, and the fact that remote workers are treated like real employees even though they're not in the office. The one negative I found repeated consistently was the workload. It's apparently a pretty intense job, with lots of calls coming in at all hours, and sometimes there are barely enough customer service people to handle the high volume. 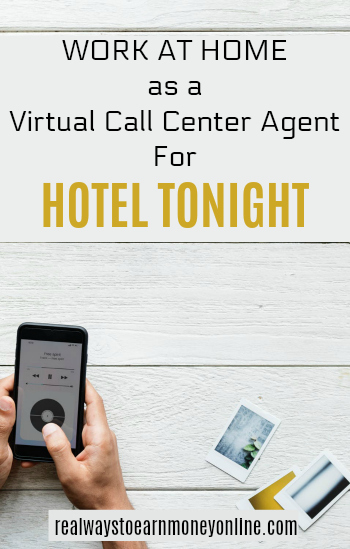 If you're interested in working for Hotel Tonight, keep tabs on their website for the positions that show “virtual call center” in the description.